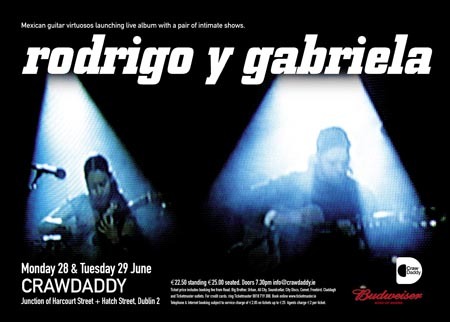 Rodrigo Y Gabriela playing CrawDaddy shortly after it opened. Must have been 2004. I've just been reminded of this because I was looking for the theme to Pirates of The Caribbean in iTunes with my son and found out that one of the film's soundtrack had a whole lot of Rob Y Gab on it, complete with hidden Metal references in the song titles. Good for them. Sounded pretty good too in the 30 second clips. Glad I didn't have to watch the film to find that out. Sad to see the POD Complex of venues close its doors last weekend. Great venues.